HP 30b Business Professional comes pre-packed with an extensive library of finance, business, real estate, and statistical functions, it’s easy to use and learn. The intuitive layout, fast processor, and 2-line alphanumeric display give you quick answers. Add custom calculations for your course curriculum or line of business with convenient programming capability. Easy to use and learn. 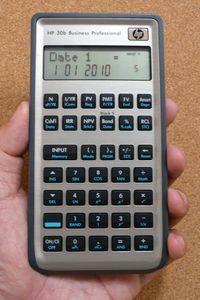 Its user interface is similar to the HP 20b. Lots of powerful business and statistical functions. Plenty of memory - can store up to 50 pairs of statistics or cash flow data. Programmable - 290 steps macro programming. HP’s accurate rotate-and-click keyboard technology. Choose your data entry option of Time-saving RPN, familiar algebraic, or traditional chain algebraic. Built-in Black-Scholes Equation, used to calculate the theoretical premium for calls and puts.